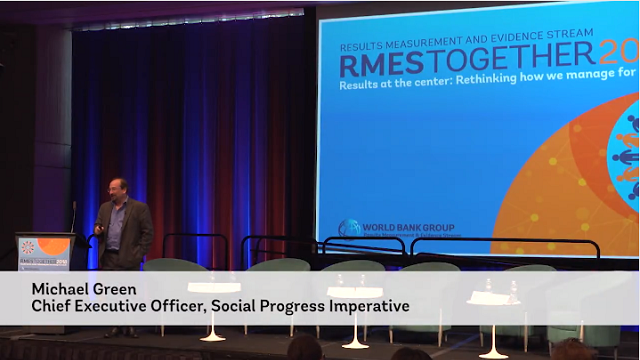 Results Measurement and Evidence Stream (RMES), launched in June 2014 is the first WBG-wide initiative bringing together talent, knowledge, and innovations to establish standards and provide operational solutions on results measurement and evaluation. 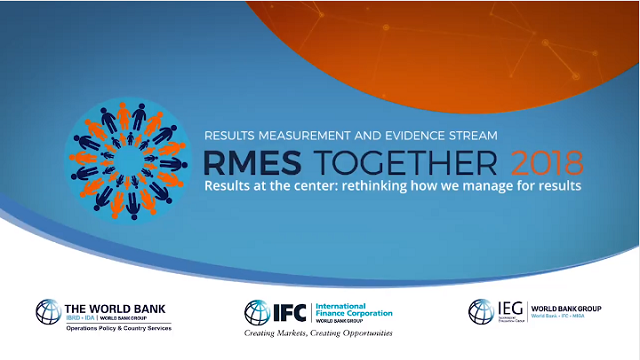 As of March 2018, there are more than 300 RMES members across the WBG. The event theme is Results at the Center: Rethinking how we manage for results. Focusing on development results and the scale of impact is important to ensure that WBG will make a successful shift to emerging priorities to support the development agenda for 2030. WBG plans to systematically pursue an innovation-learning-scaling approach, monitor results, promote learning and accountability, and strengthen its overall evaluation framework. Behavioral changes in the institution will be required, from leadership to operational teams, to focus on results. RMES Together 2018 will challenge you to think beyond the technical and financial aspects of operations and start projects off with a results-oriented design based on a solid theory of change and lessons learned. In this Bite + you'll join panelist for the Opening Session, hear from Featured Speaker, Michael Green, and listen to fast and fun ignite-style presentations from teams inside and outside the WBG. How can we improve the way we manage for results at The World Bank Group? How can we improve the way we manage for results at WBG, and what does it mean to us at management and task team levels? Hear diverse perspectives from across WBG on lessons learned, areas for improvement, and the future of WBG results management. Come share your perspectives and pose questions to the high-level panel. An economist by training Michael Green is co-author (with Matthew Bishop of The Economist) of Philanthrocapitalism: How Giving Can Save the World and The Road from Ruin: A New Capitalism for a Big Society. Previously Michael served as a senior official in the U.K. Government's Department for International Development, where he managed British aid programs to Russia and Ukraine and headed the communications department. He currently serves as the CEO of the Social Progress Imperative. Join him for this engaging featured speaker presentation! 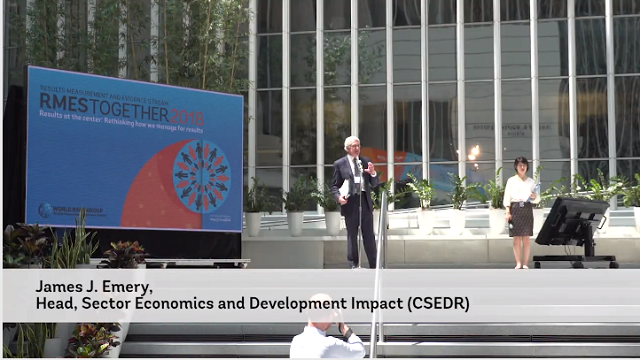 In this video tune into the Results Fair, and hear from teams from inside and outside the World Bank Group as they showcase innovative approaches and tools to monitor and evaluate results of their operations. Join these fast and fun ignite-style presentations which cover 19 different focus areas.